Tres Hombres platter at Goode Co. Kitchen with an old-school crispy taco. Photo by Phaedra Cook. Goode Co. 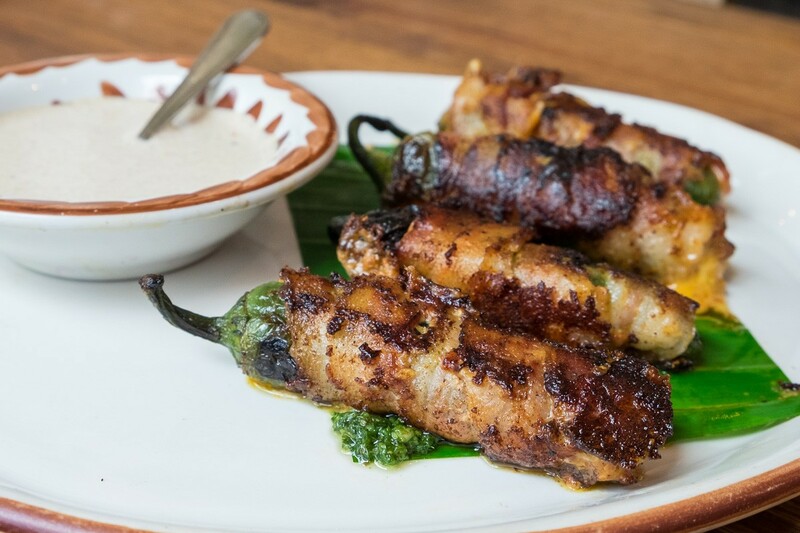 Kitchen & Cantina at 9005 Katy Freeway is the longtime restaurant family’s relatively new Tex-Mex concept—and its executing the revered cuisine extremely well, which is good because Houstonians tend to otherwise grab their pitchforks. It’s a clean-lined, airy restaurant with big windows that let the sun shine upon four food groups as essential to Houstonians as the air they breathe: margaritas, queso, housemade tortillas and big enchilada platters. Goode Co. Kitchen off the I-10 feeder in the Memorial area. Photo by Phaedra Cook. The Memorial-area location is actually the second Goode Co. Kitchen. 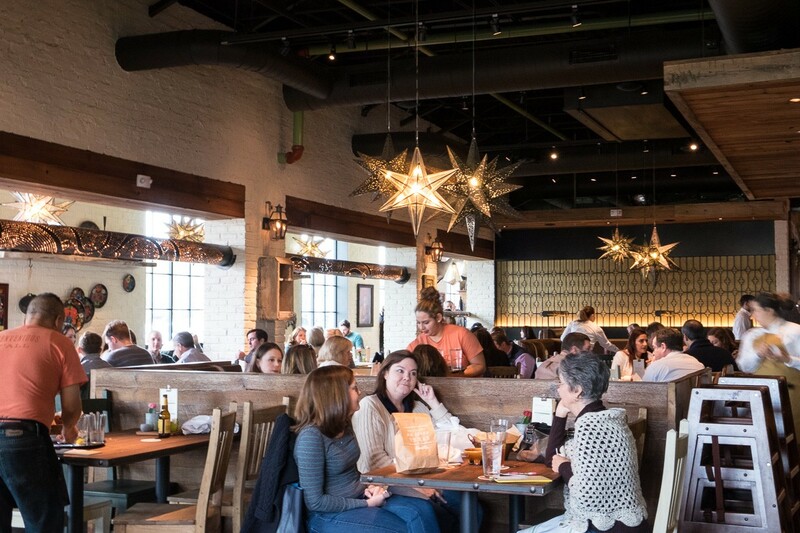 The new local chain debuted in The Woodlands last September. The Memorial location is sandwiched on the feeder road between Goode Co. BBQ and, closer to Beltway 8, Goode Co. Seafood. So, it’s safe to say the company understands the clientele in that part of town. A Tex-Mex shack wouldn’t thrive here, but a place that doesn’t fancy up the staples yet provides great, sit-down service certainly will. On our lunchtime visit as a guest of the restaurant, the house was packed. 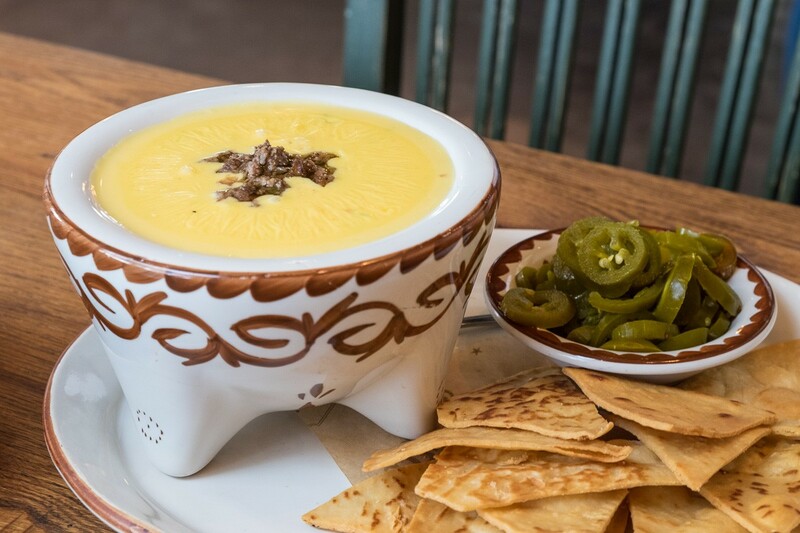 Any visit to a Tex-Mex place has to start out with queso. It’s a cardinal law of eating. While waiting on a big molcajete filled with the stuff, there is a very worthy roasted salsa and tortilla chips to snack on in the meantime. (As usual, the trick is to not fill up too soon.) Including both frozen and shaken variants, there are 10 different margaritas on the menu perfect for the initial volley. These range from the $9 house Damn Goode Margarita (available frozen or up), made with Tequila Arette Blanco, lime juice and orange liqueur, to a $25 whopper. That’s the Cadillac ‘El Dorado’ Margarita made tableside with a special Goode Co.-selected Single Barrel Milagro Añejo, Tequila Arette, Gran Clase Extra Añejo, lime juice and Grand Marnier. The Mexican Martini at Goode Co. 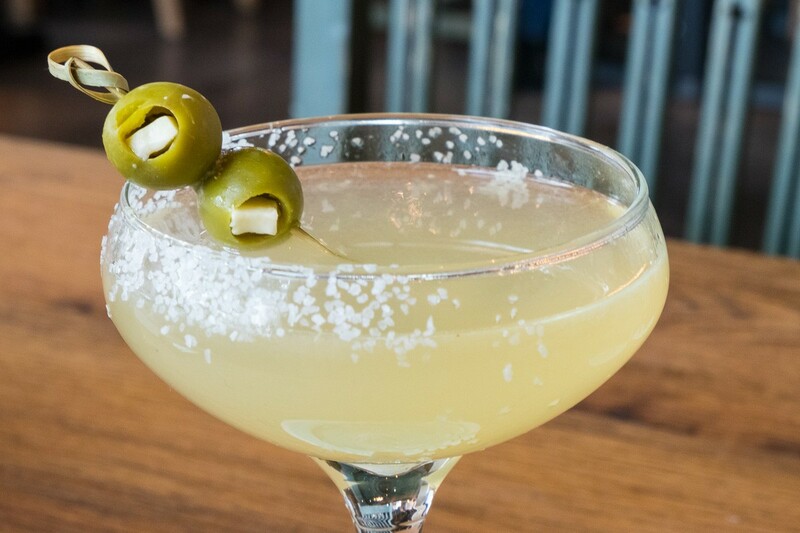 Kitchen is a margarita-dirty martini hybrid. Photo by Phaedra Cook. More interesting, however, is a margarita hybrid: the $11 Mexican Martini with Tequila Ocho Plata, lime juice and dry curacao, made ever so slightly dirty with a skewer of green olives for garnish. This is the kind of Friday-appropriate drink that a guest can start out with for lunch and find that somehow a third one has appeared, it’s 3 p.m. and it’s best to order more queso, fake car trouble and skip the rest of the day. It’s so well balanced between tart, sweet and light grassy notes from the high-quality tequila that it just seems to disappear. Back to that queso: a large is $9 and small is $7. Both are generous portions. Add picadillo (seasoned ground beef)—we did—or opt for the extra-fancy Bob Armstrong that also includes pico de gallo, sour cream and guacamole. The extras will cost between an additional $2 and $6, depending on the selection and whether these are for a small or large queso. Jalapeño Rellenos appetizer at Goode Co. Kitchen. Photo by Phaedra Cook. Here’s an ordering trick: when fielding a potential menu item by a server, watch the eyes and look for the smile. Those cues made the $8 Jalapeño Rellenos the other must-order appetizer. These are split, flattened, roasted peppers stuffed with homemade chorizo, Mexican cheese and served with spiced crema. Those with very sensitive palates might want the crema, but the jalapeños we received were so thoroughly seeded and mild that it seemed extraneous. The next crucial test was a big ol’ platter of cheese enchiladas with rice and beans. 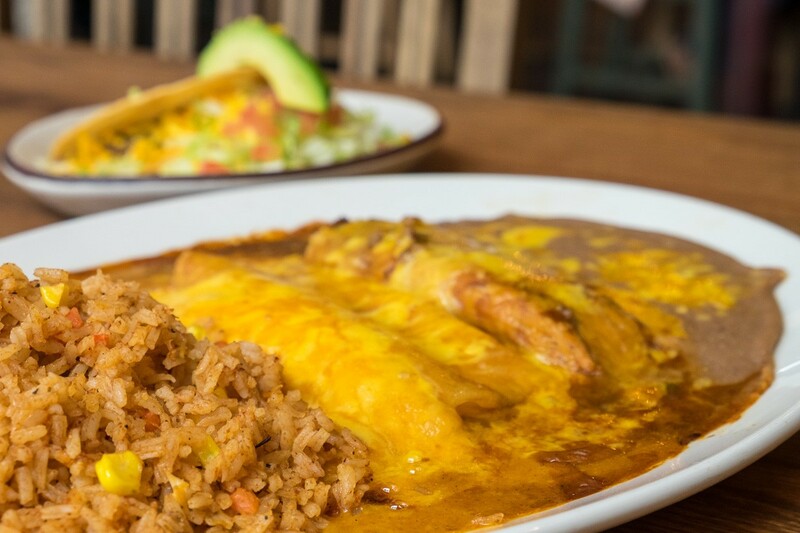 It’s a Tex-Mex essential. Screw this up and nothing else really matters. As it turns out, the $17 Tres Hombres platter, which also comes with a beef tamale and a well-seasoned, old-school crispy taco, is a perfect example of how magical simple ingredient combinations can be. For the enchiladas, beans and rice, proper heat is key. That familiar mix has to be so hot that the cheese melts into thick rivulets that mixes easily with the chili gravy. That, of course, is what the rice and beans also seem to find their way into: another essential part of the hallowed experience. Beef fajitas and quail with all the accoutrements at Goode Co. Kitchen. Photo by Phaedra Cook. The intended pièce de résistance was a platter of fajitas. 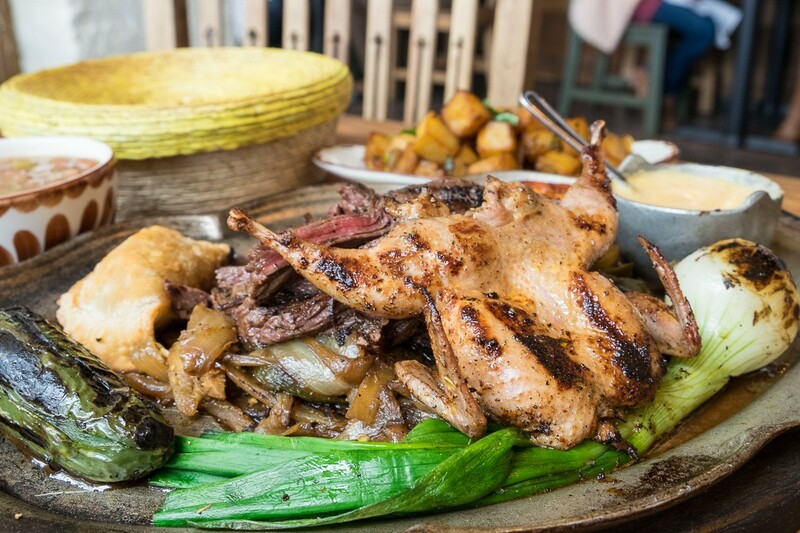 There are many options for the seared meat: beef, chicken, quail, shrimp and carnitas. For an extra $10, diners can even opt for a filet. We opted for the beef fajitas and quail for $29. The presentation is sumptuous, with a basket of the aforementioned hot, housemade tortillas (flour this time) and a fun addition of a beef empanada that had a filling reminiscent of a stuffed green bell pepper. Both meats were very tender—especially the quail which is brined ahead of time. This was, though, the moment of the only misstep at Goode Co. Kitchen. Fajitas not served on a sizzling comal aren’t as enticing as when they are. The experience of a server striding toward you with that sizzling platter, wafting meaty smells across the restaurant, is called the “fajita effect” and should be part of the experience. So why not do it? Is it a safety issue? Our server didn’t know. If there were small children at the table, eschewing hot cast iron at the table would be understandable, but that wasn’t the case. 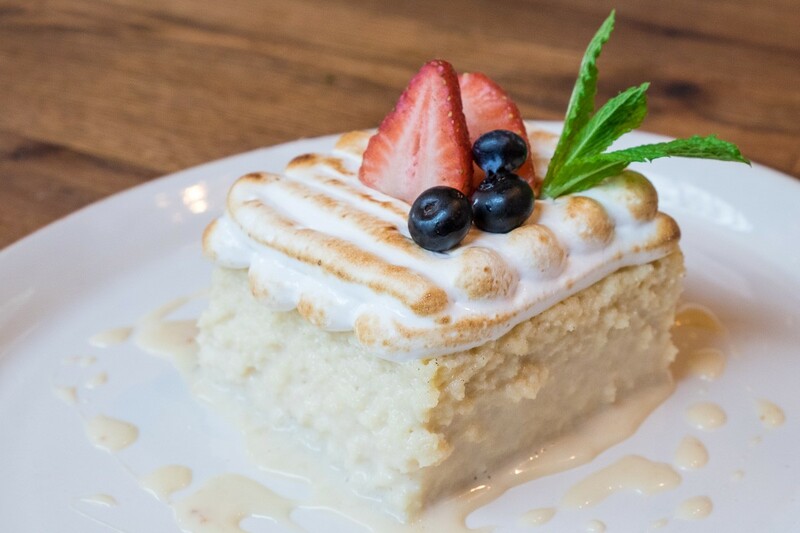 Tres Leches cake with a seared meringue topping at Goode Co. Kitchen. Photo by Phaedra Cook. The recommended dessert was the tres leches—a fine rendition of vanilla cake well-soaked in the requisite three milks: condensed, evaporated and whole. The sweetness level is balanced for an adult palate as well. Diners might have mixed feelings about the toasted meringue on top. It’s not really needed, or better than traditional whipped cream topping, but accented with fresh berries and mint, it sure is pretty. All in all, though, the new Goode Co. Kitchen is making the right moves: putting emphasis on perfectly executing most Tex-Mex essentials. There’s a big bar up front for those who want to enjoy those worthy margaritas (or sangria—or margarita variants) although there is no happy hour. Otherwise, it’s one of those places with an atmosphere that is as great for families as it is for groups of coworkers. In an area of town where Goode Co. has created its own little restaurant row, the new addition is likely to thrive. Goode Co. Kitchen (Memorial location), 9005 Katy Freeway. Hours: Sundays through Thursdays from 11 a.m. to 10 p.m.; Fridays and Saturdays from 11 a.m. to 11 p.m.